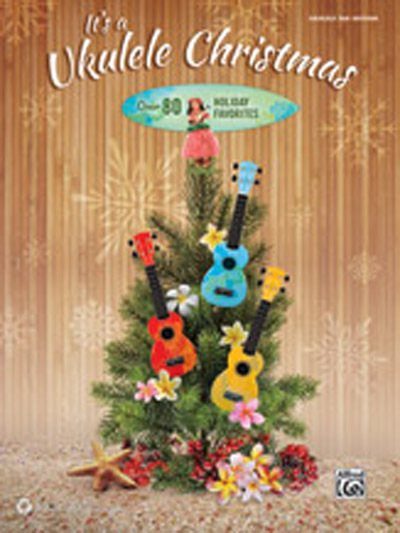 This book contains over 80 holiday songs arranged to be easily playable on ukulele. Ranging from classic carols such as “Silent Night” and “O Christmas Tree,” to popular tunes like “Have Yourself a Merry Little Christmas” and “Santa Claus Is Comin' to Town,” right on through music from yuletide movies such as How the Grinch Stole Christmas! and National Lampoon's Christmas Vacation, this book is perfect for holiday get-togethers and sing-alongs! Titles: Angels from the Realms of Glory * Angels We Have Heard on High * As Lately We Watched * Auld Lang Syne * Away in a Manger (Murray) * Away in a Manger (Cradle Song) * The Babe * A Babe Is Born in Bethlehem * Believe (from The Polar Express) * The Bells of Christmas * Boar's Head Carol * Born Is He, This Holy Child * Bright and Joyful Is the Morn * Bring a Torch, Jeannette, Isabella * Buon Natale (Means Merry Christmas to You) * Carol of the Birds * Celebrate Me Home * A Child This Day Is Born * Christ Was Born on Christmas Day * Christmas Comes Anew * Christmas Vacation (from National Lampoon's Christmas Vacation) * The Coventry Carol * Dance of the Sugar Plum Fairy * Deck the Halls * Emmanuel * The First Noel * The Friendly Beasts * Gesu Bambino (The Infant Jesus) * The Gift * Go Tell It on the Mountain * God Rest Ye Merry, Gentlemen * Good Christian Men, Rejoice * Good King Wenceslas * A Great and Mighty Wonder * Hallelujah Chorus (from The Messiah) * Happy Xmas (War Is Over) * Hark! The Herald Angels Sing * Have Yourself a Merry Little Christmas * Here We Come A-Wassailing * The Holly and the Ivy * Holy Night, Peaceful Night * Hush, My Babe, Lie Still and Slumber * I Heard the Bells on Christmas Day * I Saw Three Ships * I Wonder as I Wander * I'll Be Home for Christmas * In the Bleak Midwinter * It Came Upon the Midnight Clear * Jesu, Joy of Man's Desiring * Jingle Bells * Jolly Old Saint Nicholas * Joy to the World * The Little Drummer Boy * March of the Toys * Mary Had a Baby * Mele Kalikimaka * Noel! Noel! * O Christmas Tree (O Tannenbaum) * O Come All Ye Faithful (Adeste Fideles) * O Come, Little Children * O Come, O Come Emmanuel * O Holy Night (Cantique de Noel) * O Little Town of Bethlehem * On Christmas Night All Christians Sing * Once in Royal David's City * Patapan * Santa Claus Is Comin' to Town * Silent Night * Simple Gifts * Sleigh Ride * Stand Beneath the Mistletoe * Star of the East * The Twelve Days of Christmas * Ukrainian Carol (Carol of the Bells) * Up on the Housetop * We Three Kings of Orient Are * We Wish You a Merry Christmas * Welcome Christmas (from How the Grinch Stole Christmas!) * What Child Is This? * When Christmas Comes to Town (from The Polar Express) * You're a Mean One, Mr. Grinch (from How the Grinch Stole Christmas! ).